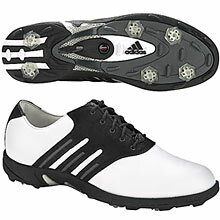 The Adidas Tour Traxion™ golf shoe is serious athletic performance footwear for the serious athlete. The Tour Traxion shoe features the Traxion™/3D Torsion system for stability and support, while the Traxion cleat helps maximize your grip with a unique stud design. From Aaron of New York, New York on 1/6/2011 . These shoes were recommended to me by a friend. They are very comfortable. I can walk around the golf course all day without any problem. Best golf shoe I've bought to date. From Anonymous of Bronx, New York on 3/26/2008 . Pro model - Nice shoes, basically perfect. 5/28/2003 – Nike tends to give me blisters with their running shoes. If these golf shoes, which I hear are the best, give me blisters . . . Response From FirstFairway: Firstfairway offers a money back guaratee on any products returned within 30 days of purchase unless the products have been destroyed. Firstfairway reserves the right for discretion.